This Collaboration Studio examines the practice of recycling and artistic production through urban exploration and hacking or rethinking of public spaces. As the world’s landfills swarm with millions of tons of discarded electronics, the examination of the critical and creative use of recycled materials becomes ever more important. 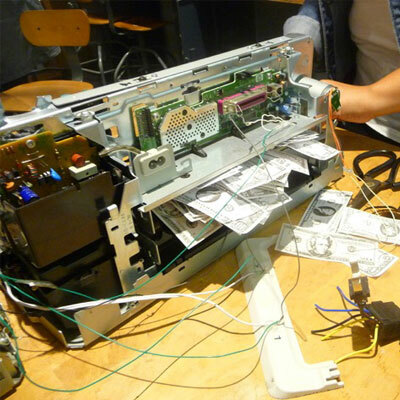 Scrapyard Challenge and Urban Hacking examines interventions in planned obsolescence through sustainable technological practice and will tackle the issues of recycling, art making, and sustainability. The course will give students challenges around the city to complete using found or discarded materials combined with embedded microcontrollers such as Arduino.